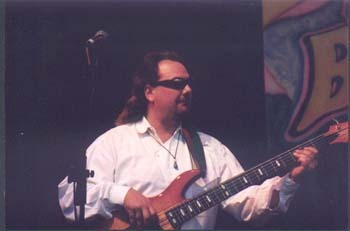 Dan was born Daniel David Cooper in Batavia, New York July 20, 1961(same day as Carlos Santana!). His family moved to Pennsylvania and then in 1965 relocated in Michigan. At around ten Dan picked up a guitar & songbook that was lying around the house and was hooked. Too many guitarists, a couple of drummers and no bassists prompted him to trade his guitar for an old bass. He soon was being ask to jam with local pickers and at age fourteen played his first paying gig. In 1981 Dan moved briefly to Denver and later that year to Houston where he's lived ever since. 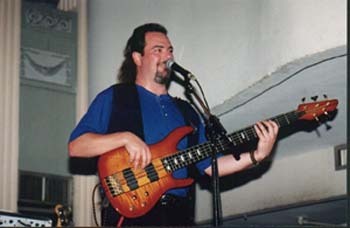 Dan played with various local acts around Houston doing rock, blues and country until 1991 when Mark May and Dan were called to do sub work on a country gig. They had met several years before and after the gig Mark approached Dan about starting a blues project. Dan agreed and the rest is history! Dan has shared bills with such greats as John Mayall, Delbert McClinton, Travis Tritt, The Smithereens, The Black Crows, Gov't Mule and countless others and of course, the Allman Brothers Band!!! Mark May & the Agitators announce that after a successful year touring and recording with the Dickey Betts Band, Mark has opted to focus his career on Mark May & the Agitators. Original Agitator guitarist Kirk McKim has also rejoined the band. According to Mark, "I want to offer special thanks to Dickey Betts for the opportunity to play together and learn from him, as well as his help getting my career started. Rita and I also want to thank Donna Betts for everything. She’s a very gracious lady." Mark May & the Agitators – Mark May, guitar, vocals; Kirk McKim, guitar, vocals; Dan Cooper, bass; and Greg Grubbs, drums - will release a new CD and tour in 2002. The CD includes “Place Your Betts”, a tribute to Dickey, as well as Dickey Betts playing funk and blues on 2 tracks. Thanks to all the fans for their support. Hope to see you out at a Mark May & the Agitators show!